Improve your leg strength with a kickboard. If your idea of swimming is wading through the kiddie-pool, it may be time to take the plunge and learn for real. Once you do, you can take advantage of a truly effective way to tone and strengthen almost every muscle group in your body. Chances are your instructor will use various types of swimming equipment to help you learn the strokes as you gain strength in the water. Most swimming props are simple to use and allow you to focus on a particular part of your body or aspect of the stroke. No more baby pool for you -- you’re a big girl now. 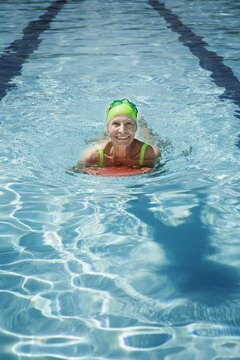 Place a pull buoy between your thighs, as high as possible, to practice the upper body movements of strokes like freestyle and backstroke. This will float your legs. Use a proper sized buoy for your body; adults should not use child-sized and vice-versa. Engage your abs, point your toes and keep your torso low in the water, just as you would if you were swimming without the buoy. Remain focused on the part of the pull that needs work, such as the entry, catch or release point. Perform kickboard drills to isolate your legs and develop a stronger kick, which helps to propel you forward when swimming. Place the kickboard in front of you in the water; extend your arms and hold onto the top to the board, lightly, with both hands. Engage your abs to keep your stomach and pelvis from dropping down. Practice your flutter kick. Vary the drill by moving your hands to the middle of the board and placing your head in the water to practice proper breathing. Wear swim goggles to see clearly in the water and to keep the chlorine out of your eyes, which can cause irritations. Being able to see while swimming can help you with your position and alignment in the swim lane. Purchase goggles that are made of a non-shatterproof material and ensure that they provide a watertight fit. Consider purchasing tinted goggles if you regularly swim outdoors in the sun. Wear hand paddles to improve your arm and hand technique of the freestyle. These are most often used for developing the catch, which is the beginning of the underwater pull during the freestyle. Use smaller hand paddles to start and increase the size as you become stronger. Stick to short periods of time, such as 10 minutes, at first to avoid an overuse injury in your arms and shoulders. Keep the palm of your hand open as it drops into the water and starts to pull back. Make sure your instructor is properly certified and has experience teaching adults how to swim. Swim only when a certified lifeguard is present. Consult a physician before beginning a swimming program for the first time. Let the doctor know if you have not worked out for a while or if you have any chronic health issues.